One of my favorite things these days is "porch time." This tradition started with the imperative to stop everything late afternoon and retire to the front porch Adirondack chairs, cold beverage optional. The afternoon sun and sunset are always an Adirondack treat here at the homestead. Lately it seems, any time is great porch time; morning tea and surfing, afternoon office work, and just doing business time. As technology progressed, so has porch time. 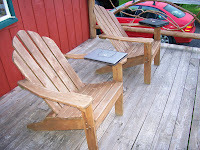 Thanks to our blasting broadband connection and wireless technology, I can work surrounded by mountain views and all those Adirondack negative ions. At the risk of stating the obvious, if you like the outdoors and can work remotely, you might consider living at least part-time in the Adirondacks. It is very special.